The Statistics Portal reported sales figures of over 378 million US dollar! Safe to say we all love soft pretzels. 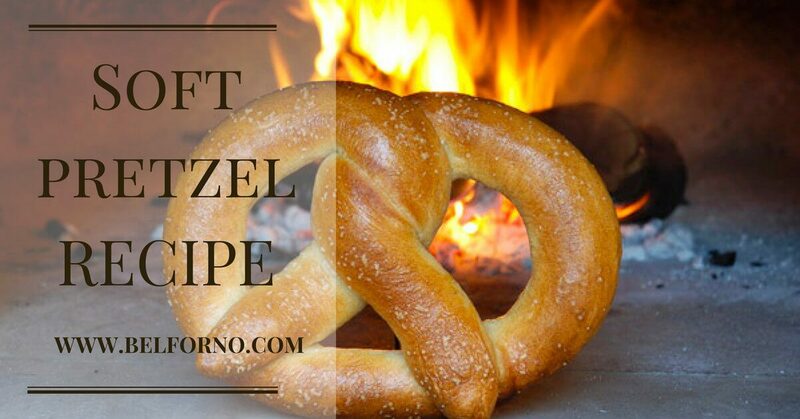 In search of the perfect woodfire soft pretzel recipe, I stumbled across this one for authentic German woodfire soft pretzels. This recipe is sure to have no preservatives, dough conditioners, or any unnecessary fats or sweeteners. Not only is this recipe simple and delicious but also health savvy. Do enjoy! Make the dough: In a large bread bowl, mix the bread flour, spelt, brown sugar, salt, baking powder and dry yeast together. Make a well in the middle and pour in the water. Mix with the handle of a wooden spoon to incorporate the water and flour mixture. Scrape down the sides and bring it all together in a ball of stiff dough. Knead this rough doughball for a few minutes to smooth out the lumps of dry dough. Knead and proof the dough: Knead the dough for 5 minutes and, when soft and supple, stretch it to form a fat snake. Curl the dough snake in on itself, put it back on the counter, cover with the bowl and let sit for an hour or two. It is important at this time to think about stretching your dough to improve the strands of gluten. The longer the better. Heat the woodfired oven: Your fire should be 2 hours old, with enough heat to sustain for an hour’s baking, but not so much heat that it will scorch the pretzels. Keep the fire to either the left or right of center, in order to heat the oven deck. Every 20 minutes for the last hour or so, move your fire side to side to evenly heat the floor tiles. A half hour before the pretzels are ready, put two thin sticks of dry wood on and 2 wrist-thick pieces and bring to a flame. A few minutes before putting in the pretzels, push the mature coals to the back center of the oven, near the wall, and brush the ashes off of the floor. There should be 6 to 8 fist-sized chunks of glowing hardwood coal and a good bed of embers, but no flame when the pretzels go in. Form the pretzels: Roll your dough snake out until it is about 3 feet long, and cut it into 2 equal pieces. Roll each piece out until it is 27 inches long. You may have to let your dough rest a few times to accomplish this without tearing the gluten. Cut two pieces of parchment 7” x 10” for woodfired. Hold the ends of one dough rope and let the middle sag down to sit on the parchment two inches in from the edge. Let the rope of dough make most of a circle on the pan and then twist the ends once around to form a loose knot a few inches from the ends. Bring the tips toward you to overlap the curve of the dough, dividing the area of the circle roughly into thirds. Repeat with the other piece. Let the pretzels rise for 45 minutes, covered with a cloth. Stretch each pretzel out slightly halfway through to improve its shape. Make an assembly line: Boil 3 quarts of water. Have a 12-14 inch sauté or frying pan ready on the stove. Put a rack to one side with a pan under it to catch the excess egg and salt. Mix the egg and water until frothy in a ramekin and have a brush handy. When the pretzels have risen for 45 minutes, put the water into the sauté pan and keep at a boil. For woodfired baking, have two wooden peels ready to one side, and move the fire around as noted above. Boil and coat the pretzels: Put a pretzel face down into the boiling water, for 40 seconds only. After 40 seconds (no more! ), gently flip the pretzel with the backs of two spoons and boil on the other side for a further 30 seconds. Remove to the rack. Brush the pretzels with the egg wash twice to ensure a good coating. Sprinkle 1/2 teaspoon of salt onto each pretzel. Carefully move the pretzels back to the parchment and arrange the final shape. Bake the pretzels in a woodfired oven: Slide the pretzels on their parchment mats to within 8” of the coals. Close the door completely. Bake for 7 minutes, by which time the pretzels will have miraculously sprung up to twice their former height. Carefully turn the parchment, using a metal peel and a gloved hand, and bake for a further 7 or 8 minutes, again with the door closed. Once brown and lovely, remove the pretzels from the oven, place them on a rack and allow them to cool for about an hour.